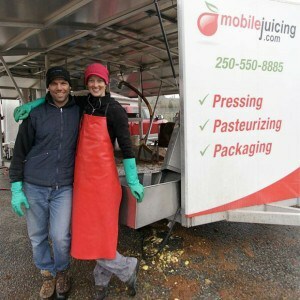 Mobile Juicing history is a tale of learning, growing and pursuing the path to perfection. The account below is but a scratch on the surface of our whole story. If you find it interesting, lets talk over a glass of juice one day. We Bought some apples to practice our skills. Thank you to the BX Press for allowing us to use their space! We ran the pack press (aka rack and cloth) and gravity fed filler at about 300 L/hr. for as many orchards that would have us. We were new to the industry and had a very basic food safe plan, approved by interior health and satisfied the CFIA. Team Trovato ran the machine full time and devised a plan for more efficient pressing. We also offered custom printing on the boxes. Hand loading blueberries into the destoner. Bring on the cherries! First Cherry season was a success, we did lots of berries too! Hooray for the belt press – @ 500L/hr we are in love, but our pasteurizer can’t keep up. Let’s streamline this whole trailer! Ordered a full Kreuzmayr trailer with a BIN TIPPER, washing elevator, destoner, bigger belt press (750L/hr), a higher capacity pasteurizer (800L/hr) and force-fill bagger! New trailer arrived late and we missed much of the cherry season! New machine lived up to it’s capacity and served everyone well. With the force-filler we were able to introduce smaller, pouch style packaging. 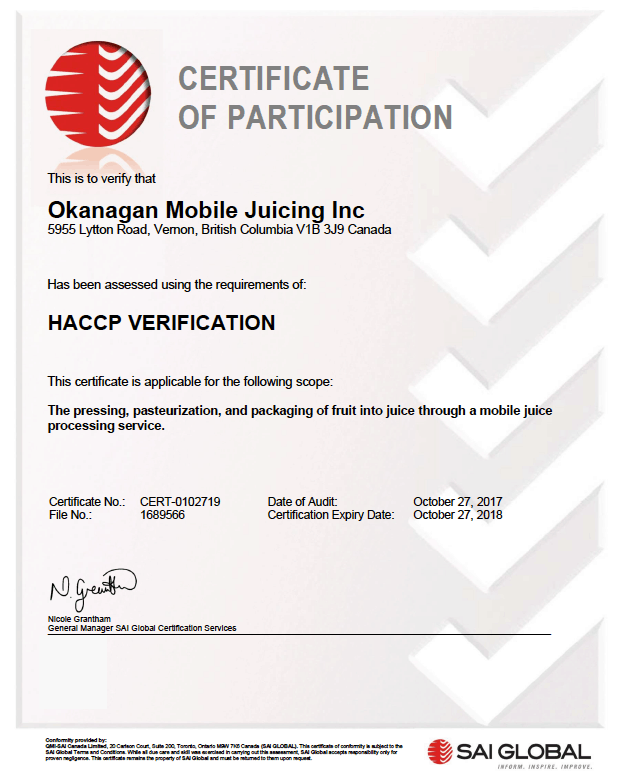 Incorporated Juicing.Systems, our sister company specializing in Fruit and Beverage Processing Solutions and got the contract for North American Distribution! Ran a full cherry season, as well as peaches, apricots and all berries. 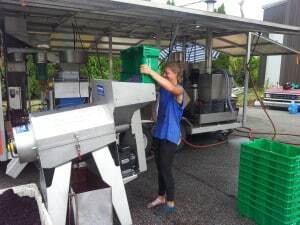 Helping all of our apple juicing and cider clients to our full capacity, time to up our capacity again? Sold Trailer #2 and ordered #3 for higher capacity one more time. The biggest, baddest of all Mobile Juice trailers arrives! Pursued the Post Farm Traceability and Food Safety Program. Successfully completed the HACCP plan verification audit!